Dr. Elena Giusarma will present "Neutrino Cosmology- Weighing the Ghost Particle with the Universe" on Tuesday, February 12th at 11:00am in Fisher Hall 132. Neutrinos physics is one of the most fascinating research areas that has stemmed from the interplays between cosmology, astrophysics and particle physics. Cosmology provides an independent tool for the investigation of neutrino properties since it is sensitive to the absolute scale of neutrino masses. Measuring the masses and the ordering of these particles would be of extreme value to unravel the departure from the Standard Model (SM) of Particle Physics. A robust detection of neutrino masses is among the key goals of upcoming Cosmic Microwave Background (CMB) and Large-Scale Structure (LSS) surveys. In this talk, Dr. Giusarma will review the main physical effects of massive neutrinos on cosmological observable and summarize recent progress on neutrino mass constraints, focusing on LSS. Dr. Giusarma will also discuss galaxy bias as a limitation towards fully exploring neutrino information hidden in LSS data. She will then propose a method aiming to constrain the scale-dependent galaxy bias using CMB lensing-galaxy cross-correlation and will illustrate the effect of this methodology on the constraints of neutrino masses. Finally, she will discuss the potential of future cosmological observations to precisely measure neutrino masses. 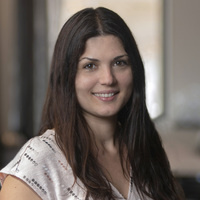 Dr. Elena Giusarma is currently a Flatiron Research Fellow at the Flatiron Institute’s Center for Computational Astrophysics (CCA), a division of the Simons Foundation. Previously, she was a Postdoctoral Fellow at the Carnegie Mellon University and a Visiting Researcher at the Lawrence Berkeley National Laboratory and UC Berkeley. She also held a Postdoctoral Research Fellow at the Istituto di Fisica Nucleare, University of Rome “Sapienza”. She earned her Ph.D. at the Instituto de Fisica Corpuscular, University of Valencia and the M.Sc. in Astronomy and Astrophysics at the University of Rome “Sapienza”. Her work focuses on analyzing cosmological datasets and performing statistical inference to study the role of neutrinos in our Universe. She is also interested in developing new machine learning algorithms to apply to cosmological challenges.